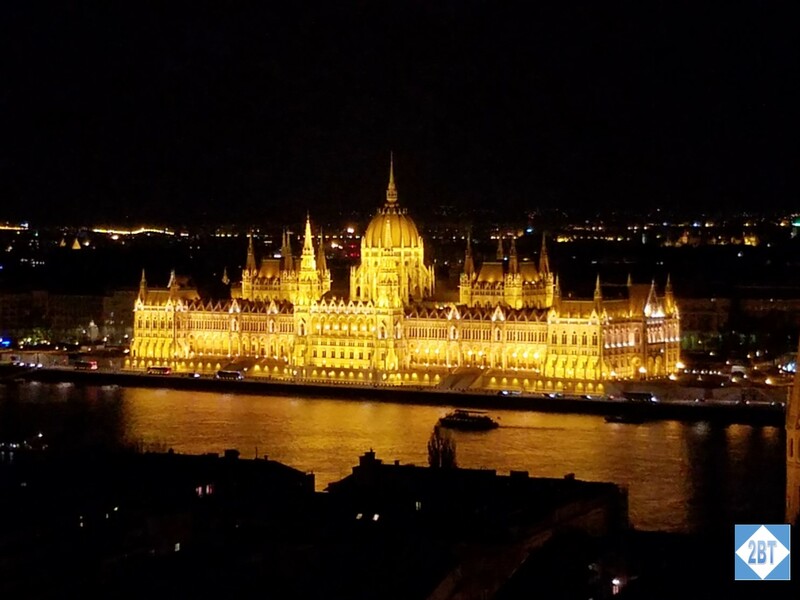 We awoke the next day expecting to board motorcoaches that would take us into Budapest. 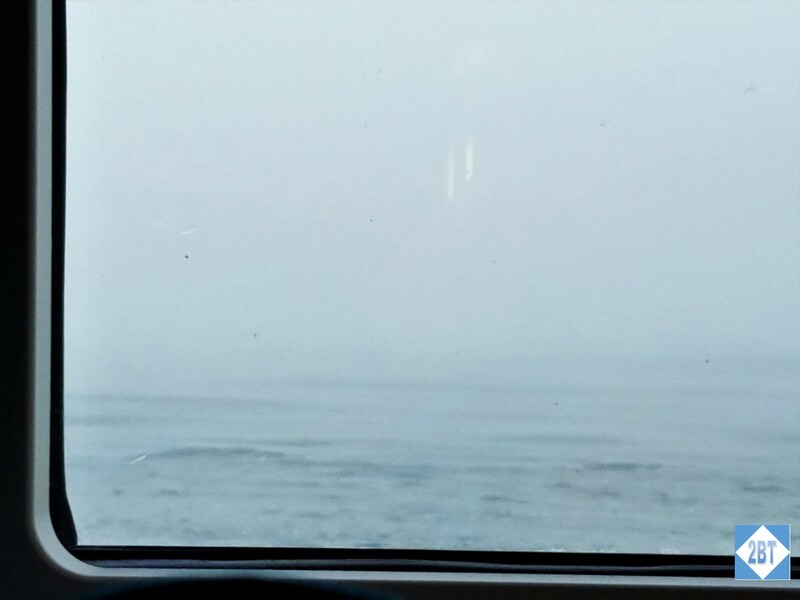 However when we look out from our cabin the fog was so thick we couldn’t see the riverbank! Viking decided that it was pointless for us to wend our way along a beautiful drive if we couldn’t see anything, so they announced we’d be staying on board until we docked in Budapest around mid-day. That also meant that our city tour was postponed until the afternoon and any optional tours we had scheduled for the afternoon were canceled – though of course the refunds wouldn’t be processed until after the cruise was complete. The view from our cabin. The Danube is not THAT wide – where’s the riverbank?! After busy days of touring it was actually kind of relaxing to have a morning to ourselves where we could linger over breakfast and catch up on emails (thanks to the free wi-fi). Gradually the fog lifted and we had a sunny day, though it was a bit cool on deck. While I hear sailing into Budapest at night is a glorious thing, it wasn’t half-bad at noon either! Naturally lining up the perfect photo was difficult because the longship was constantly in motion but the captain took us well past our port so we could at least catch sight of the beautiful views before he turned around and docked us in the shadow of the Chain Bridge on the flat, Pest side of the river. After lunch we boarded our motorcoaches for our city tour. 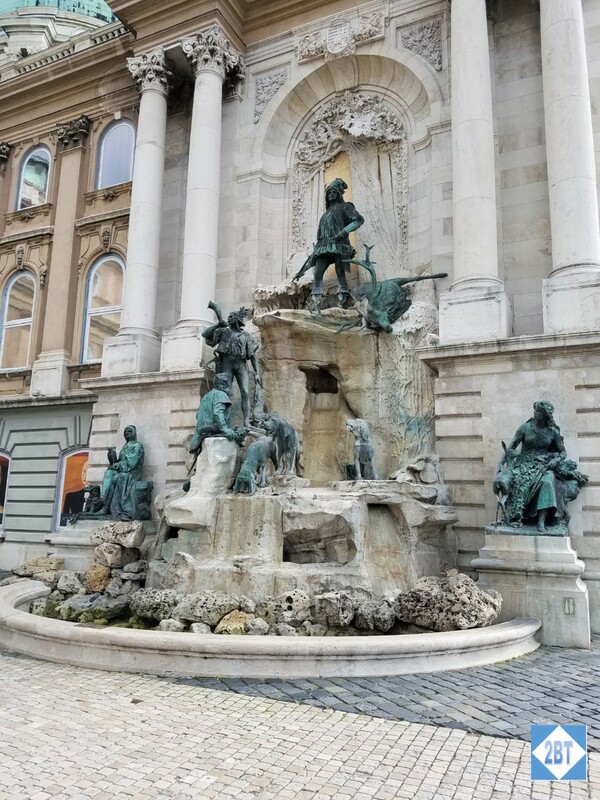 We first drove around Pest and my roommate and I noted several attractions that we’d want to check out over the weekend after the official tour was done. Then the bus drove us across the river and up the hill to Buda. 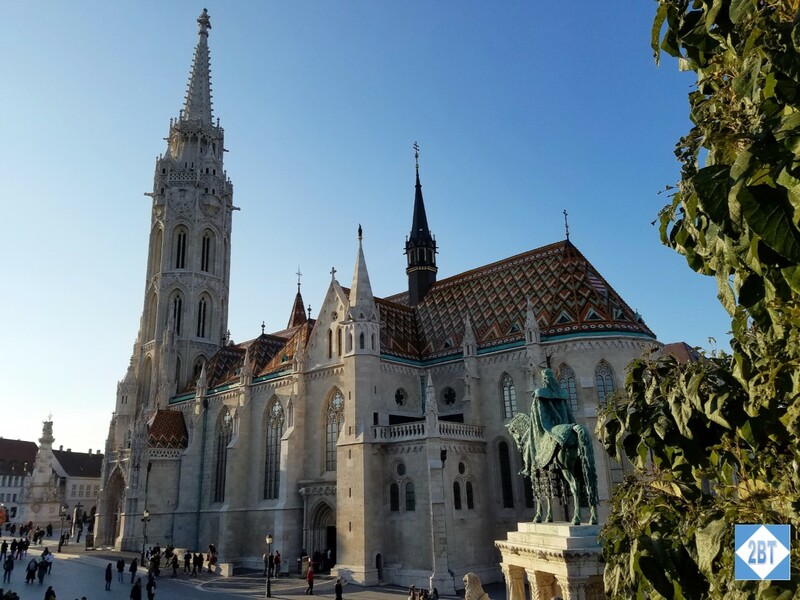 It was on this drive that we learned that Buda and Pest were originally two separate cities that were joined together in 1873 and that most of us had been incorrectly pronouncing its name. The correct pronunciation of the last syllable is “pescht”. The guide explained how Hungarian is a very literal language so that any time you see letters, or combinations of letters, in Hungarian, they’re always pronounced the same way. She said it makes learning English a bit difficult for native Hungarian speakers because sometimes letters are pronounced one way and sometimes another. But everyone we heard speaking English did so very well. Of course we were mainly in tourist-heavy areas, so perhaps that was to be expected. In Buda we were allowed to exit the motorcoach and stretch our legs. 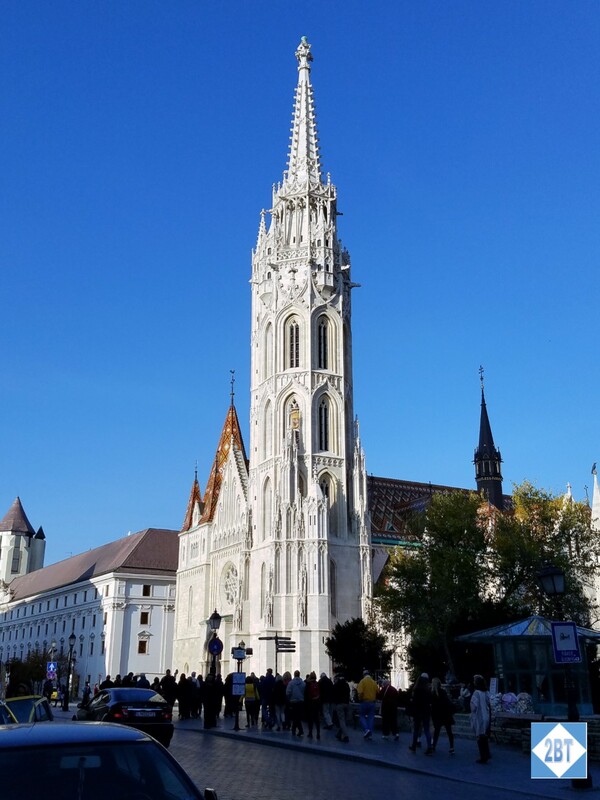 Our first stop was Matthias Church, a Catholic church at the center of the Castle District. The current version of the church was built in the late 14th century with extensive renovations done in the 19th century. Like many of the old churches we see in Europe it’s just fascinating how such magnificent work could have been done without modern equipment. 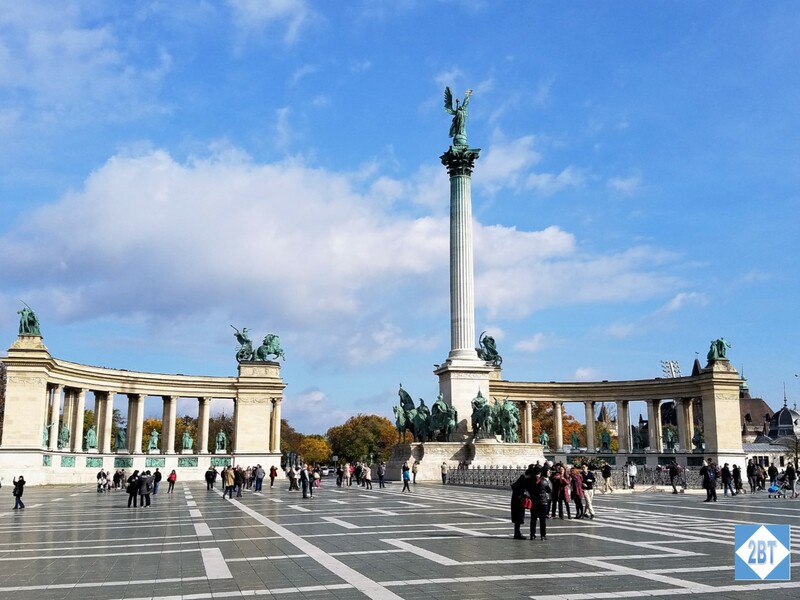 It was badly damaged in World War II and in the mid-1940s both German and Soviet soldiers occupied it during the Hungarian uprising. The government helped fund its restoration 1950-1970 and in 1984 it finally got a new organ to replace the one destroyed in WWII. 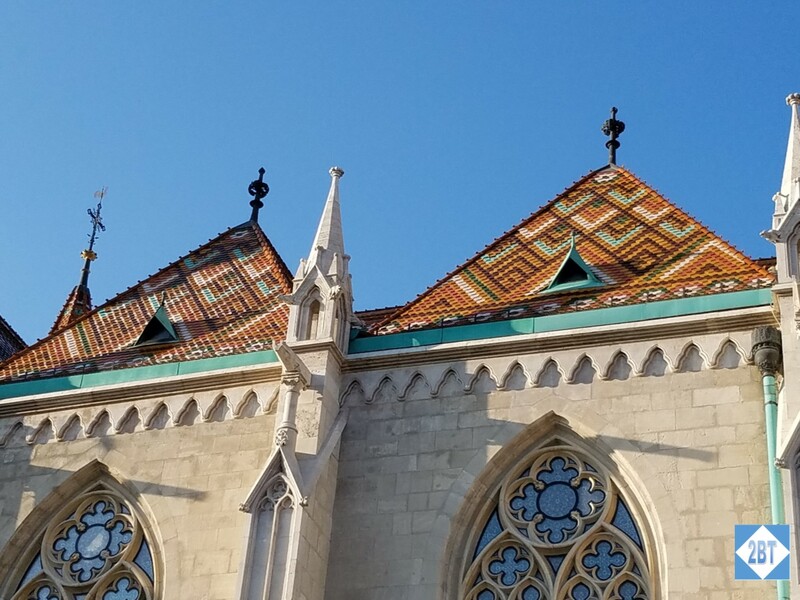 I loved the light-colored stone on the exterior and how the tiles in the roof created patterns. Outside the church, on the side closest to the river, a statue of King Matthias, who ruled Hungary in the late 15th century, looks over the church. The interior of the church is as dark as the exterior is light. It’s really a startling contrast. Yet once my eyes got adjusted I realized the walls and columns had a number of patterns and were quite beautiful in their own right. Click on the photos below to enlarge. Behind the church, built into the cliff that overlooks the river is the Fisherman’s Bastion. It’s a giant terrace with walkways that were a lovely place to look down on the Pest side of the city. There are several towers on the Bastion with some of them housing small bars or restaurants. The Bastion itself is actually best viewed from below. Looking back at Pest from the Bastion made for some nice daytime views. But as we’d learn later it was spectacular at night. 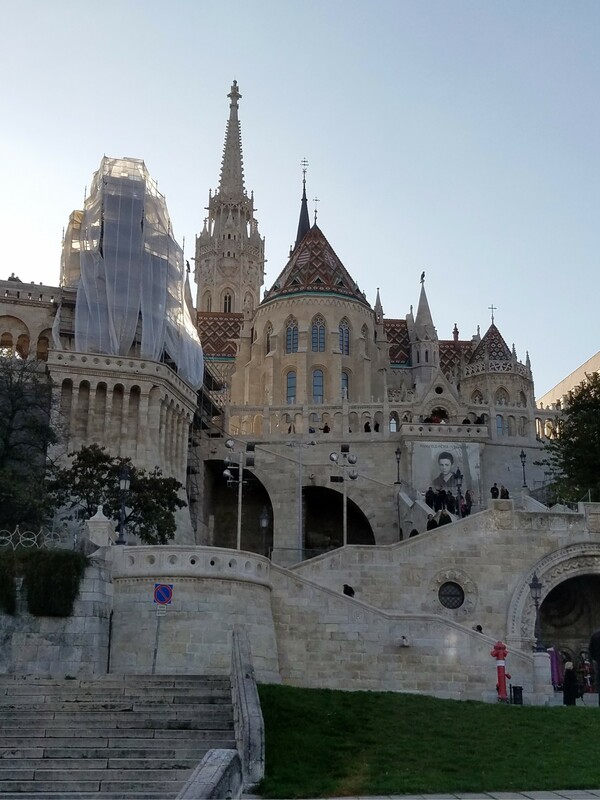 After viewing these sites we were left to wander the Buda area on our own for a bit. 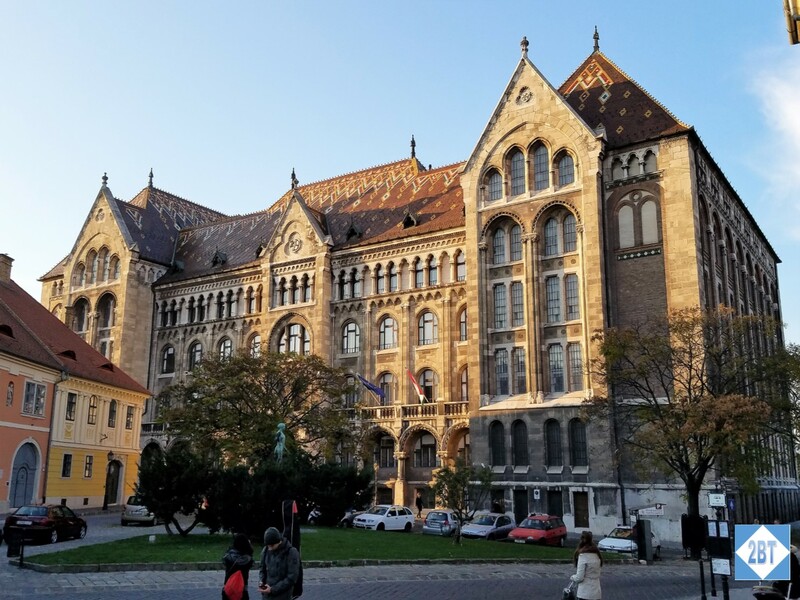 My friend and I wandered away a little and found the National Archives of Hungary. We didn’t know what it was at the time but thought it was an impressive-looking building. When we returned to the group we got back on the motorcoach for one last dinner aboard the Bestla. But after dinner we once again found ourselves back on the top deck of the longship, this time gazing in amazement at the sight before us. 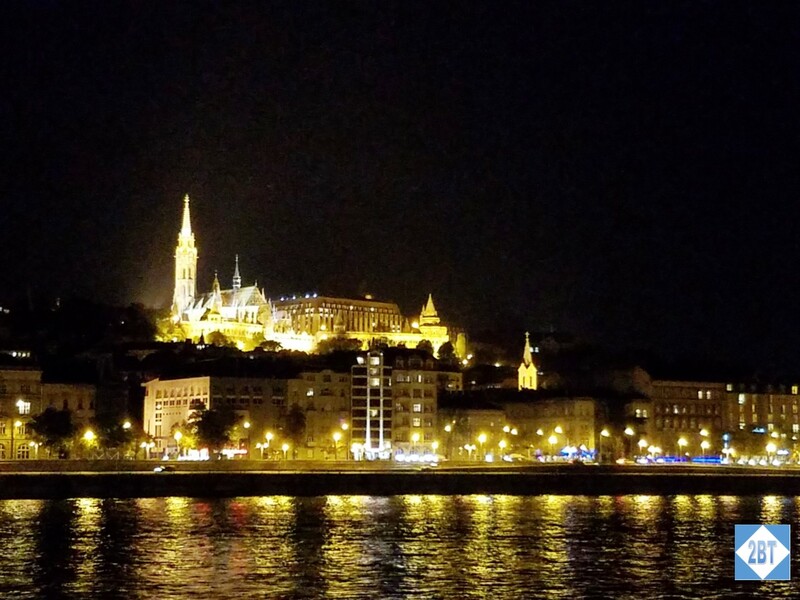 This was why cruising along the river at night was so special – Budapest is lit to the hilt, making for pictures so lovely even my little camera phone couldn’t mess them up! The next morning we bid most of our friends goodbye as they returned to the States. Meanwhile my roommate and I had another couple of days to explore Budapest. We left our bags aboard the Bestla and set out to explore Pest. Our first stop was just down the riverbank from where the Bestla was docked. 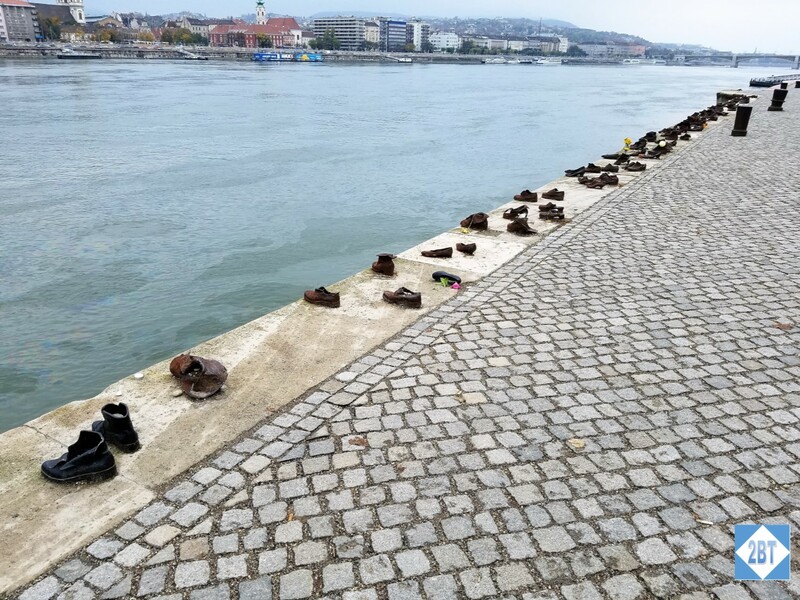 It’s the Shoes on the Danube Bank memorial, which is a number of pairs of iron shoes affixed to the riverbank. These represent the 3,500 people – 800 of them Jews – who were shot by the fascist Arrow Cross militiamen during World War II. The victims were told to remove their shoes and line up at the edge of the river. That way when they were shot their bodies would fall back into the river and be carried away. From time to time people leave pairs of real shoes among the iron ones. From the river we walked up into the city and down Andrássy Avenue, a major thoroughfare that winds through the city. Our tour the day before had followed this path and we’d taken note of several points of interest that we wanted to visit. Our first stop was at the Terror House museum, located at 60 Andrássy Avenue. This building had been the headquarters for the Arrow Cross (national socialist) party during World War II and later for the Hungarian Secret Police. Both of these organizations used the building for administrative purposes as well as for torture. The self-guided tour allows visitors to wind their way up two or three floors of exhibits before ending with an elevator ride down to the dungeon. And it is a literal dungeon with chains and torture devices still in place. It was a very creepy and very powerful end to the tour. All of the narration in various exhibits, both from videos and the display plaques, was in Hungarian. In each room there was at least one information sheet in other languages. Even so it didn’t take much to convey what had gone on in this place. We visited Terror House on a Saturday and were fortunate to arrive shortly after it opened. There was only a very short line to get our tickets. We spent probably 1.5-2 hours inside. By the time we left the line extended around the corner, so get there early! 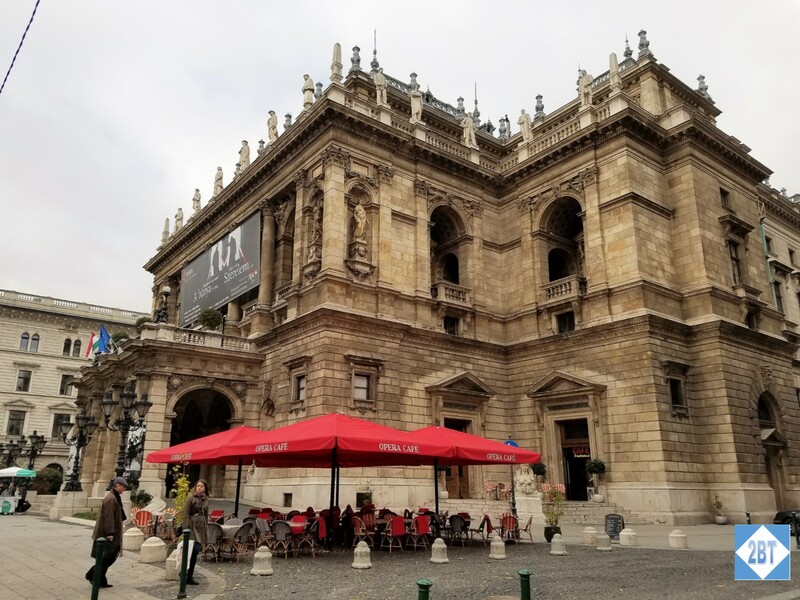 While we didn’t go inside, we stopped to admire the Hungarian State Opera House. It was completed in 1884 and renovated in the 1980s. It’s grand re-opening date was exactly 100 years after its original opening date. Andrássy Avenue ends at Heroes’ Square. The Millennium Memorial is the centerpiece of this plaza. It commemorates those who gave their lives for Hungarian independence. 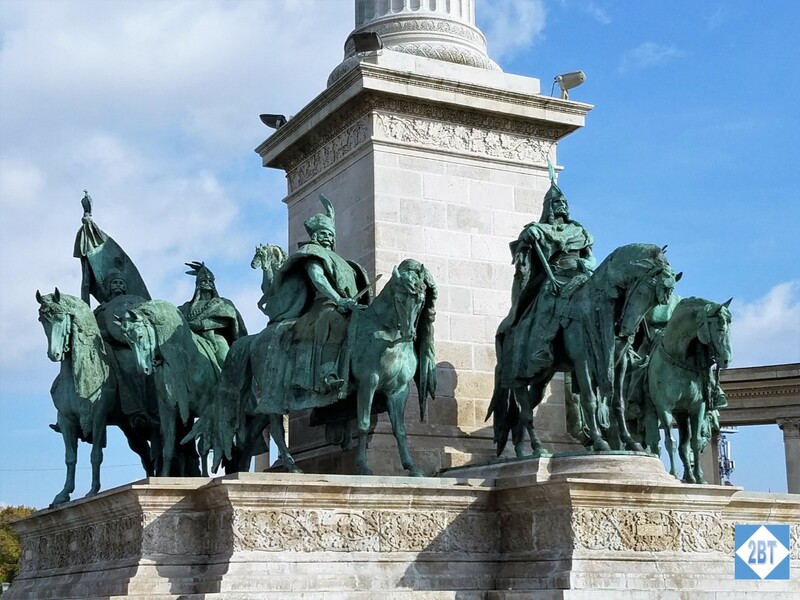 Around the base of the column are statues of the Seven Chieftains of the Magyars, which were the tribes of Hungarians who founded the nation. Just behind the square is the entrance to City Park. And just inside the park is the Vajdahunyad Castle. It was built in 1896 as part of the country’s Millennium Celebration. It was meant to showcase landmark buildings from across the country. As such it has a number of different architectural styles: Romanesque, Gothic, Renaissance, and Baroque. As it was not meant to be permanent, the first version was built of cardboard an wood. But it proved so popular that it was rebuilt with stone and brick from 1904 to 1908. Today it’s the home of the largest agricultural museum in Europe. 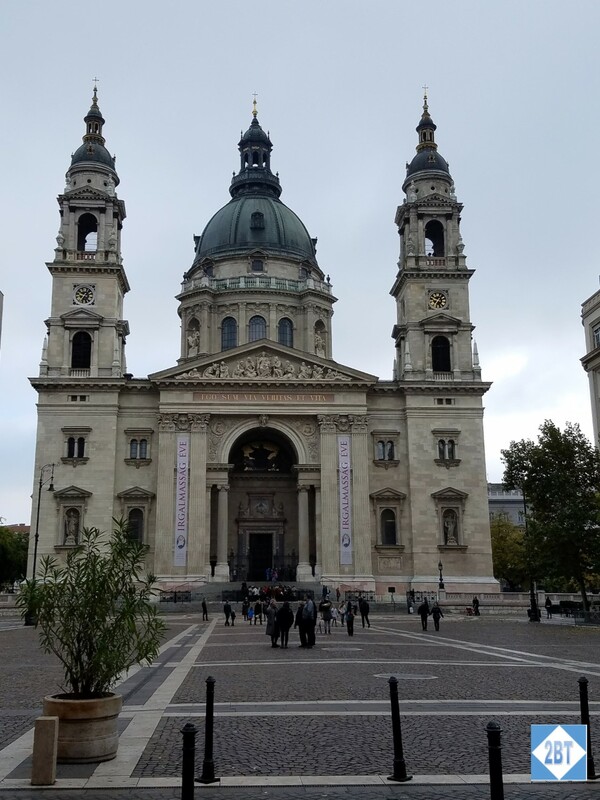 After a stop for lunch and a gelato, we made our way back toward the river and stopped at St. Stephen’s Basilica. 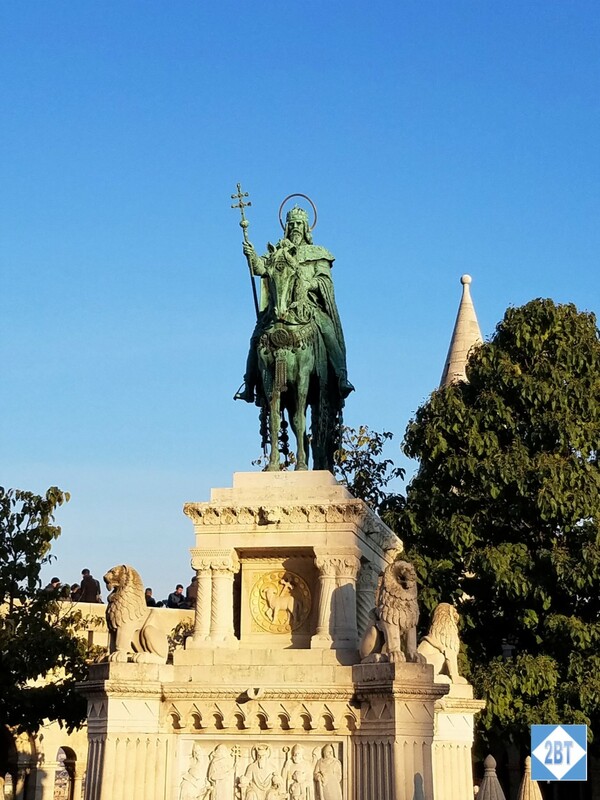 It’s named after the first king of Hungary who reigned in the early 11th century. It took 54 years to complete and opened in 1905. Construction was delayed in 1868 when the dome collapsed, which required everything to be demolished and rebuilt. We made our way back to the Bestla and collected our luggage. 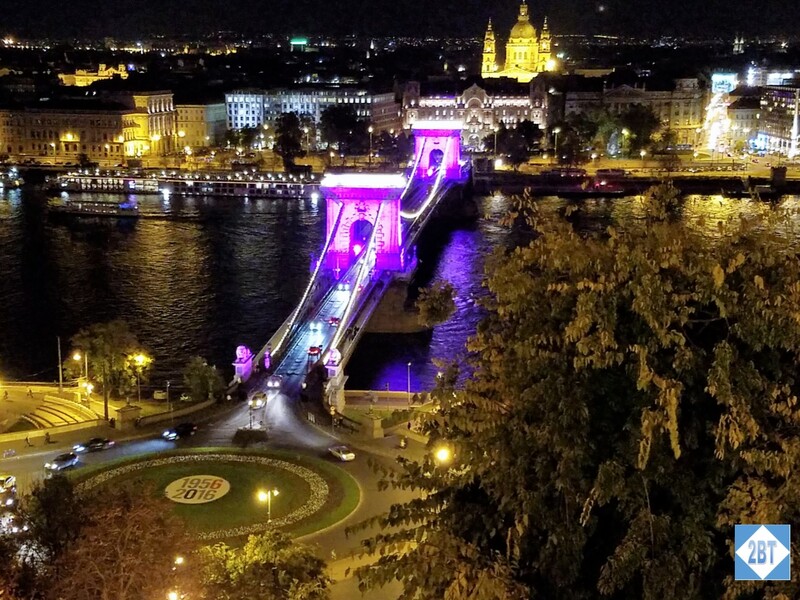 If we’d been adventurous we could have wheeled our bags across the bridge, ridden the funicular up the hill to Buda and lugged them to our hotel. But having walked for several hours we opted for a taxi. After dinner we walked around Buda, enjoying the relative lack of people. 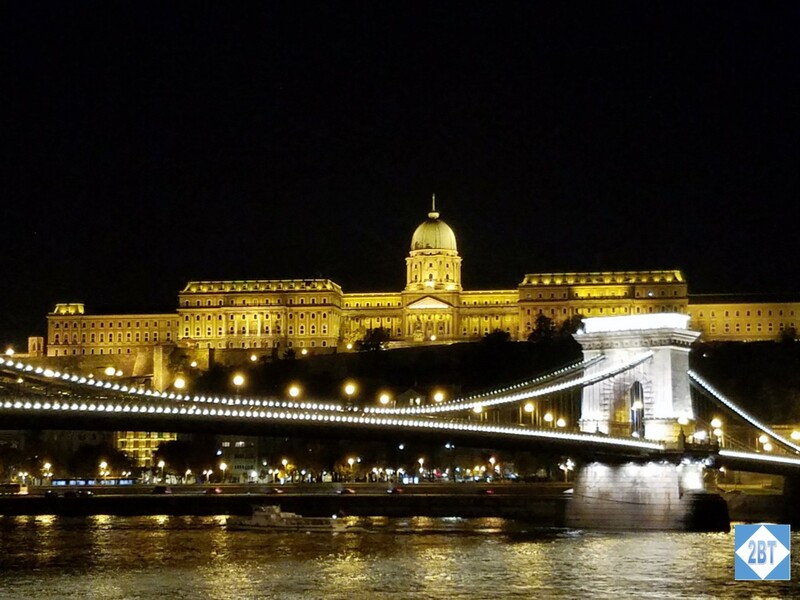 We walked along the Fisherman’s Bastion and found that the views of the Parliament building and the Chain Bridge were perhaps even better at night, being lit up as they were. The Chain Bridge and St. Stephen’s as seen from the Fisherman’s Bastion. 2016 marked the 60-year anniversary of the Hungarian Uprising. 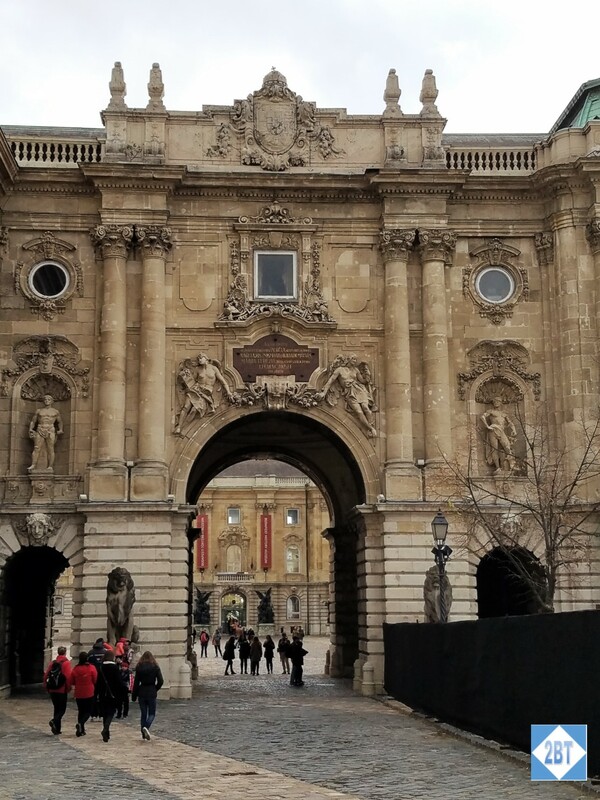 We then walked over to Buda Castle. Even up close it’s very dramatic at night. The next morning we went back to visit the museum inside the castle. We watched the changing of the guard and took some more photos, though they don’t seem nearly as interesting in the daytime. 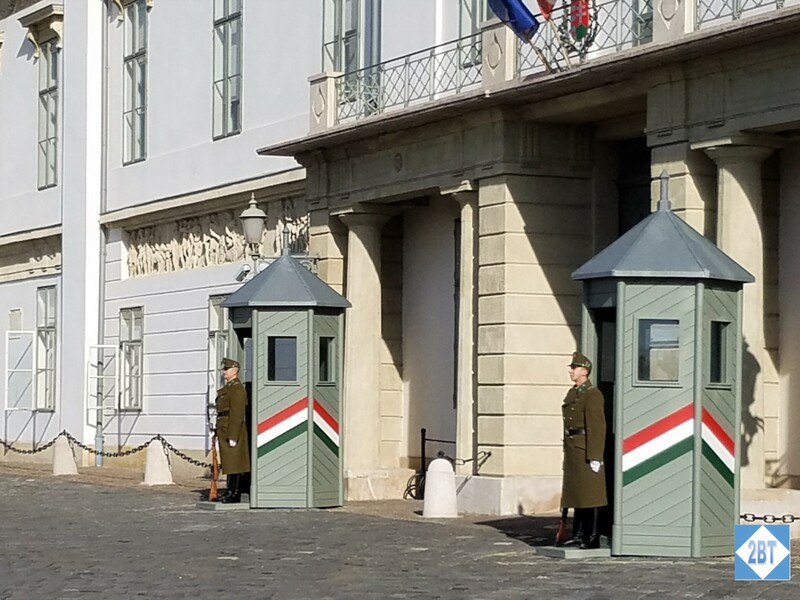 Guards outside Buda Castle – though not the museum portion. Main entrance to the castle. The lions look quite docile now. The Mattias Fountain, which shows the king with his group of hunters, hounds and a killed deer is the most photographed object in the palace, possibly because photos are not allowed inside the castle. It was the one item outdoors that photographed better in the daytime. As we contemplated what to do after lunch, we saw a sign for the Hospital in the Rock Atomic Bunker Museum. Intrigued, we read a bit about it online and decided we wanted to visit. We had to wait about an hour for the next available tour but it was worth it. Photos were not allowed inside but that probably helped keep the tour moving. Underneath Castle Hill there are miles of caverns. While some are natural, others were dug by hand in preparation for World War II. 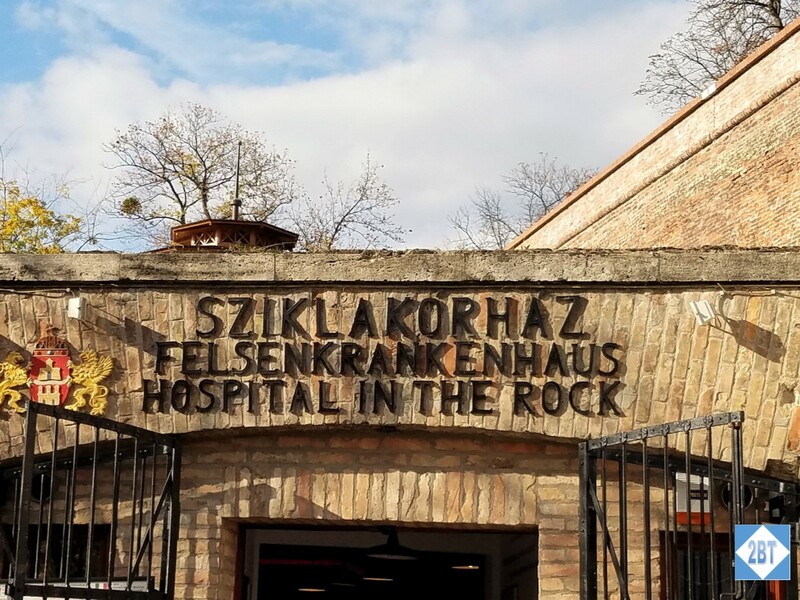 The facility was designed to treat 60-70 patients at a time but during the siege of Budapest in 1944-45, it held as many as 600. The museum uses dummies to illustrate how various chambers were used and while it at first seemed creepy to see these wax figures, it did a great job of illustrating just how crowded conditions were. The hospital was used again during the Revolution in the mid-1950s. The staff had to live inside and there were six children born here. Until the mid-1980s, hospital staff conducted annual nuclear training inside this facility! We enjoyed a lovely dinner with a couple of friends who’d stayed over on the official Viking extension. 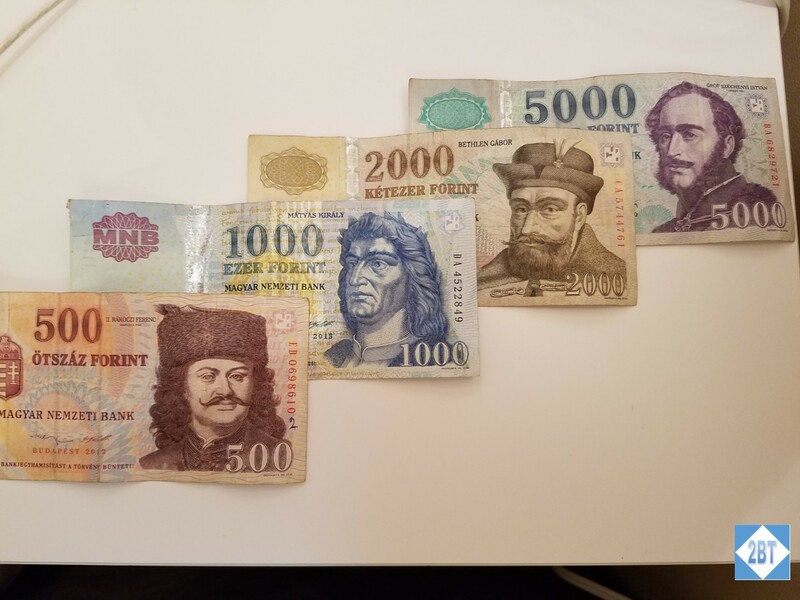 We found that a number of restaurants did not accept credit cards so be sure to get some forints if you visit. We left our hotel very early the next morning for the trip back to the States. We’d had a terrific time but duty called.